This entry was posted on Tuesday, April 15th, 2008 at 9:11 pm	and is filed under Fitness Food, Salads and Light Soups. You can follow any responses to this entry through the RSS 2.0 feed. You can leave a response, or trackback from your own site. Hi Lisa & Chris! 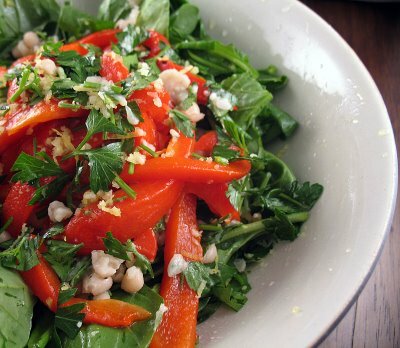 Thank you for visiting my blog and leaving a comment on carrot salad:) It led me to your deliciously looking arugula salad which happens to be one of my favorite greens:) Loved your blog and subscribed to it to be updated on your yummy foods! Cheers! Wow! There is nothing not to like about this beauty. If you like hearty salads with beans, you might also enjoy this one with lima beans and Spanish chorizo.